But I also love hate. You could say I have a love-hate relationship with hate. I hate that I feel that way. Which is why I wrote this book. It’s a book I love to hate, and vice versa. My book is called the Joy of Hate for three reasons. One: the original title, “Black, Lesbian and Proud” was already taken. Two: it refers to the biochemical commotion that erupts in my brain when I feel an urge of strong distaste for something that bugs me. It’s an experience that is both exhilarating but ultimately exhausting (as fruitless as self-pleasure). When I feel that anger, I cannot do anything but scratch at it. It’s a mental mosquito bite and it feels good to keep digging at it. Three: the title’s stronger meaning salutes the freedom one feels rejecting, hating, or mocking things you aren’t supposed to reject, hate or mock — meaning the liberal, romantic, misguided opinions operating under the guise of the greater good. And four: it exposes people who get off pretending to hate something, or hate you, in order to score political points. These are the phony toleratic — a kook who claims to be tolerant, until he runs into someone who disagrees with him (you). The toleratic travel in packs, called the tolerati. Examples of tolerati: soros-funded bloggers, hyenas, the Manson family, Hollywood. The tolerati traffic in faux hate, as a way to elevate their profile, and lower yours. They will overlook the sleaze on their own side (coming in various forms, like Bill Maher and syphilis), while demanding you apologize for a “cruel joke” that harmed no one. The people I describe are your laughable enemies. And mine too. I invite you to hate them with me, joyfully. 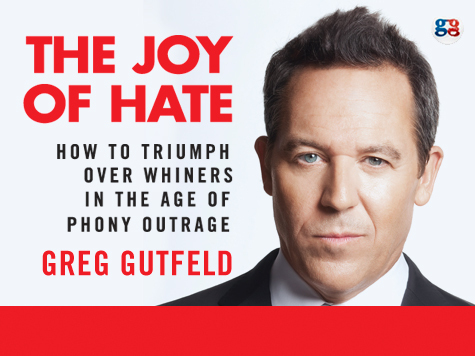 The Joy of Hate focuses on the hypocrisy of modern tolerance — that it thinly disguises a growing, acceptable intolerance for the things that made America super-awesome. The origin of this phony intolerance springs from one source: the desire to be cool. Everything done in life these days springs from a fear of dorkiness. I called this “dorkophobia,” and every time you use it, I get three dollars. Despite the fact that it’s the uncool who make the trains run on time, it’s the cool to get the cred. The definition of cool: mass popularity without much achievement. It’s how Obama got elected. Ask anyone who voted for him, “Why did you do it?” and the convoluted, wide-eyed answer will ultimately be translated into: “He’s cool and that other guy wasn’t.” The media pushed this to the hilt; and much of the public bought it; giving stuff away is cool — especially when it’s others people stuff — and perceived as philanthropic. So what is perceived as cool, when it’s really the opposite? – Fake work that doesn’t require building, moving or doing things. In 2008, a community organizer beat a war hero who spent years in a prison camp. Apparently that’s cool. – Destroying things. Did Pete Townsend ever think of the maid as he trashed his 25th hotel room? – Victimhood. The elevation of the David and Goliath myth as a universal storyboard dictating that evil can be good, as long as it’s smaller than the good. If America was a house, the left would root for the termites. – Code words. Language that aptly describes things is uncool. However, euphemisms created to avoid hurting the feelings of our adversaries is not. Hence, Ft. Hood terror is workplace violence. Which, I guess that makes Hurricane Sandy a pool party. – Talking about your identity. If you’re gay, bisexual, transgendered, Raelian, or Eskimo, chances are I’ll hear about it. If you are less proud of what you do than who you do then you’re considered cool. Where does the tyranny of the cool begin? As soon as you realize being cool pays off. When you’re a kid. In classrooms across the country, kids are learning to gain favor from teachers and peers, and the elevation of “pretend-caring” as a function of cool gets you grades and girls. Stretch this over a decade or so into college, and it’s no wonder the streets are flooded with beta males who talk from the back of their throats as they bowl in Brooklyn — ironically. The cool’s hold on society’s throat is seen everywhere. Remember that Jon Stewart rally a few years back; that was a celebration of the cool over the uncool (the uncool being the Glenn Beck rallies, the Tea Party, FNC watchers). The cool owns the film industry, as villains take on intriguing personalities, while anyone with a blackberry or a briefcase is considered worse than evil — uncool. Being pro-choice is cool. Speculating too much on what abortion really means — that’s way uncool. Assorted slugs on death row are cool; their victims are uncool — for never really getting over it. Sometimes coolness can be confusing. Nobody smokes in LA. But they all do in movies. Somehow smoking is cool, only if you’re already cool. When you see a truck driver or a postman smoking, the tolerant break out the phony cough. They’d never do that around Brad Pitt. Being political is cool, as long as it’s progressive. Conservatives by nature hate politics and politicians. Liberals love it, because it makes them feel cool. Talk to any liberal friend, and they’re running for office when they’re running their mouth. “I must tell you about the bake sale we had for the Guatemalan water snake.” No you don’t, but you will. Shut up. Immigration as an idea is cool neutral. But discussing the definition of a border? Uncool, dude. Sure, other countries have them (the ones people are fleeing from); but discussing the possibility of an American border is smeared as racist in origin — the ultimate in uncool. I’m probably racist for writing that. Who pushes the cool? The media, of course, who seeks to portray anything traditional as silly, dorky, and outmoded. The stuff that worked, apparently, is stupid, because it worked. Witness how the media mocked a gentle mess like the Tea Party but embraced the soiled rag of Occupy Wall Street. To the network and newspaper hacks, one was simply way cooler than the other. One reminded them of their parents, the other reminded them of themselves. Without a bath. Why is this duopoly, the cool vs. the uncool, so important? It won an election. Showbiz beat substance. Style creamed success. This happens in a culture that salivates over youth, glamour, and glibness. Fashion has no use for Mitts. The funny thing about cool? It’s not cool. At all. In fact, what’s truly cool is the rebellion against the perceived, predictable rebellion of the cool. Why aren’t conservatives cool? Why are they perceived as intolerant when it’s the other side who are truly the hateful ones? It’s a fair question. We have the cool message. It’s “Step off.” Or, for you old schoolers, “don’t tread on me,” which applies domestically and internationally. It’s not cool to have a government intrude into every aspect of your life, under the guise of “help.” The new electorate must learn this, or we are doomed. For we know there is nothing cool about dependency. And there’s nothing cool about anti-exceptionalism, increased regulation, government control in all sectors, and a fractional country based on race and gender. What’s cool is building businesses, military supremacy (which keeps us free to be cool), unity over division (once called patriotism), and competition (which is the universal engine for self-improvement). All of this may sound dorky, but it’s as cool as James Dean. We need to teach people how to love this country for the reasons that made this country what it is. It shouldn’t be too hard to win converts, with a message like that. But we haven’t. Which is why last Tuesday was necessary. The cool cats who claim victory last week cannot be too thrilled. For it is a wake up call for the rest of us, the uncool. It’s time for new blood. We have the message. We just need the messenger. In the meantime, the cool kids have to try to govern. Which is kind of like James Dean trying to drive. Unfortunately, we’re all in the passenger seat. But we’ve got two years to find another driver, folks. Ladies and Gentlemen: start your engines.